It’s been a week of signings, contract extensions, arguments over the reserve grade and a developing fracas between Featherstone Rovers and the Leigh Centurions. The game never stands still for long. London Broncos continue to reap the rewards of the transfer and loan markets having announced the capture of Saints centre Ryan Morgan for the entire 2019 season. Morgan is surplus to requirements at Saints after they signed Kevin Naiqama for the next campaign. Chris Chester extended his coaching contract at Wakefield Trinity with another three year deal to take him to the end of 2021. Since joining the club in 2016 he’s overseen two consecutive fifth place finishes and an appearance in a Challenge Cup semi-final. 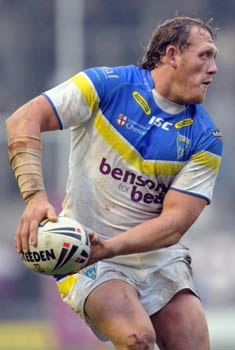 Thirty-seven year old Benny Westwood has signed a contract extension to cover the 2019 season at the Warrington Wolves, his eighteenth season in the Primrose and Blue. After a frustrating injury lay-off, Dominic Manfredi has celebrated helping Wigan Warriors secure last season’s Champions crown by putting pen to paper on a new three year deal at the DW Stadium. He’ll be vying for a place in new coach Adrian Lam’s side as Wigan look to rebuild after the departure of coach Shaun Wane. Former Featherstone Rovers coach John Duffy has been appointed as the new head coach at embattled Leigh Centurions. Duffy was sacked by Rovers earlier in the week for failing to turn up for work and is now the subject of a full-blown spat between the two clubs over alleged inducements. This one could run for a while. Hull KR confirmed that they have released Ben Cockayne from his off-field role and he has now joined the commercial department at the York City Knights. Former Leeds Rhinos favourite Matt Adamson is interested in being part of a takeover package of the Keighley Cougars who are currently in special measures after being unable to pay some players wages. Adamson is keen to take up a coaching role at the club and believes that he can play a part in identifying financial backers. Hull KR’s Joel Tomkins has signed a three year contract extension with the Robins after joining then from Wigan in mid-season. The new contract will keep him in east Hull until the end of the 2021 season. Ex-Super League star Jordan Tansey is understood to be having trials with Featherstone Rovers. The thirty-two year old utility-back has plenty of big game experience and spent last season at Workington Town. The Australian Schoolboy touring side got their five match tour off to the best of starts with a 92-0 victory over England Colleges in Newcastle. The tourists will now play against Yorkshire and Lancashire sides before two tests against England in Leigh and Leeds on the 8th and 14th of December. The Betfred Championship fixtures were released to include a fantastic feast of Sunday rugby on the opening weekend as all fourteen sides play with a 3pm kick-off on the afternoon of the 3rd February. The full twenty-seven round schedule was announced including the Summer Bash at Blackpool’s Bloomfield Road on the 17th and 18th of May. The top five teams at the end of the regular season will enter the play-offs for the one promotion place to Super League. It is understood that Salford Red Devils ex-owner Marwan Koukash has agreed to write off the debts which the club owed to him to release some of their financial burden. Salford were believed to be around five million pounds in debt and it is not known what proportion of this was to Koukash. It appears that ex-Wigan player Anthony Gelling may now be heading to the south of France to join the Catalans Dragons on a two year deal. After a season at the New Zealand Warriors in the NRL, he’d originally been heading to the Widnes Vikings but their relegation to the Championship scuppered those plans. The Super League reserve grade competition, the breeding ground for new talent, is in tatters with only eight clubs now likely to enter a team in the competition, only two of which are from Super League. There are calls from some quarters for the RFL to make the reserve grade compulsory but a number of clubs will fight against any such initiative. Leigh Centurions have re-sig ned prop forward Tom Spencer from the London Broncos after the twenty-seven year old spent the last two seasons playing in the capital. Spencer made 99 appearances for Leigh between 2012 and 2016 after initially being on dual registration there from the Wigan Warriors.